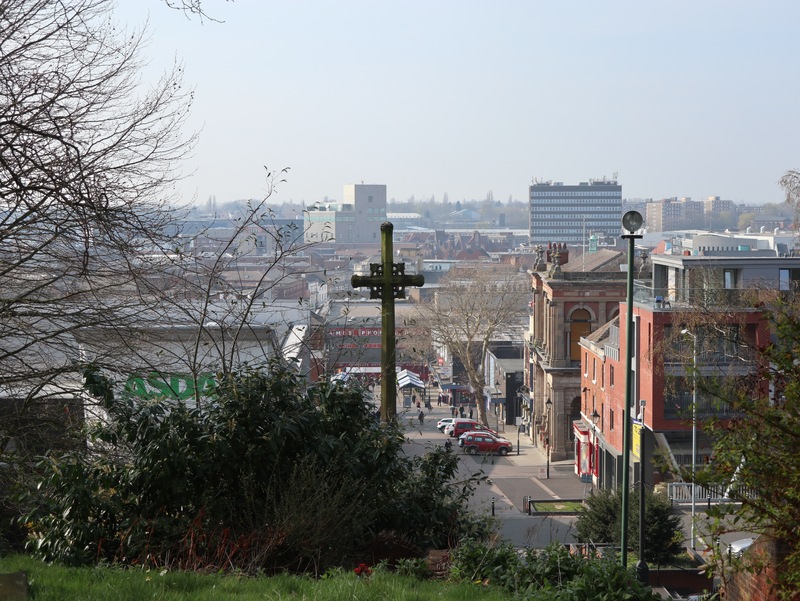 March 30th – I had to nip to Walsall at noon. I was tired from a very demanding week, but the weather was nice and the riding surprisingly easy. 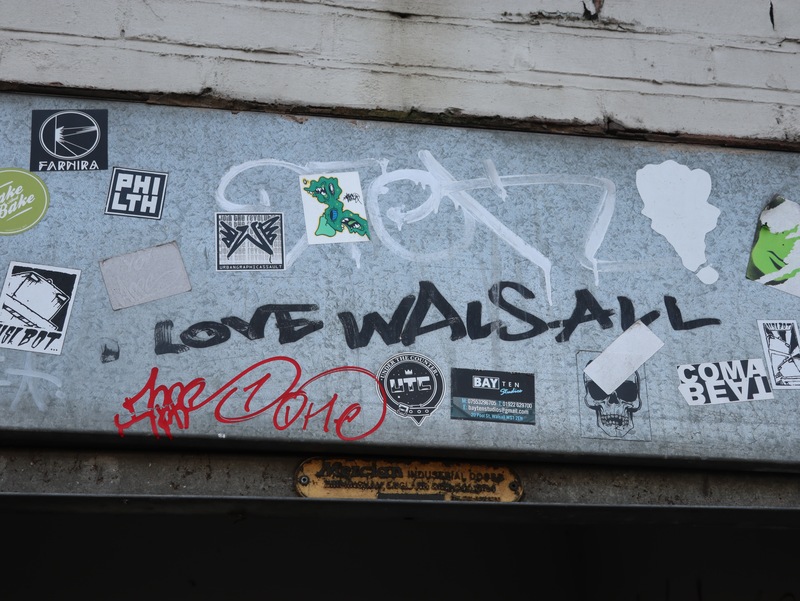 I don’t mind Walsall these days – I long ago resolved my conflict with my memories and learned to embrace the place anew. It’s never been a bad town. It’s just that many who live here hate it because it isn’t the same as when they were young. Of course it isn’t – all places change, and what folk resent is not the change in the town, but the change in themselves, I find. I pushed my bike up Church Hill and admired the view, I plodded around the town below aimlessly but enjoying it immensely. I stopped for coffee in the sun. 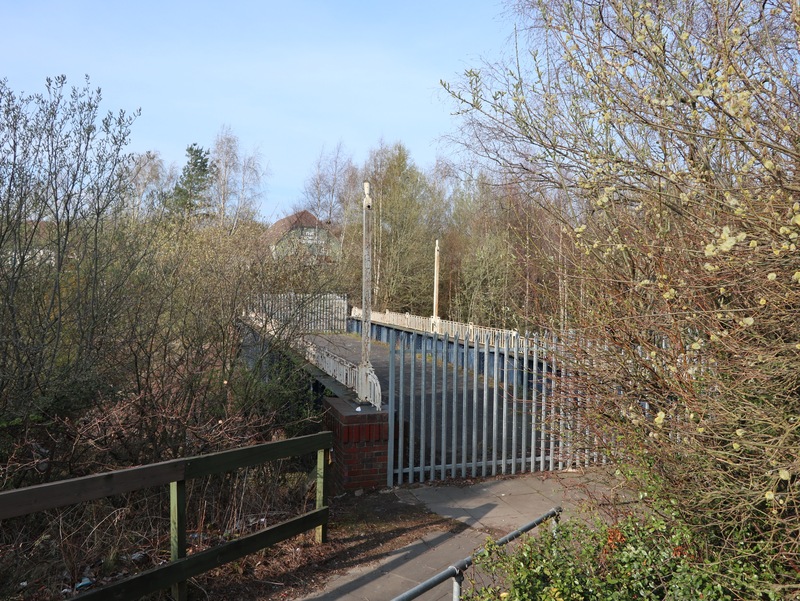 Then out on the canal to call at Sainsburys in Reedswood, where I noticed the last (nearly) whole remnant of Reedswood Power Station – the old pedestrian bridge over the long gone railway, now orphaned and fenced out of use between a pub and and the retail park. 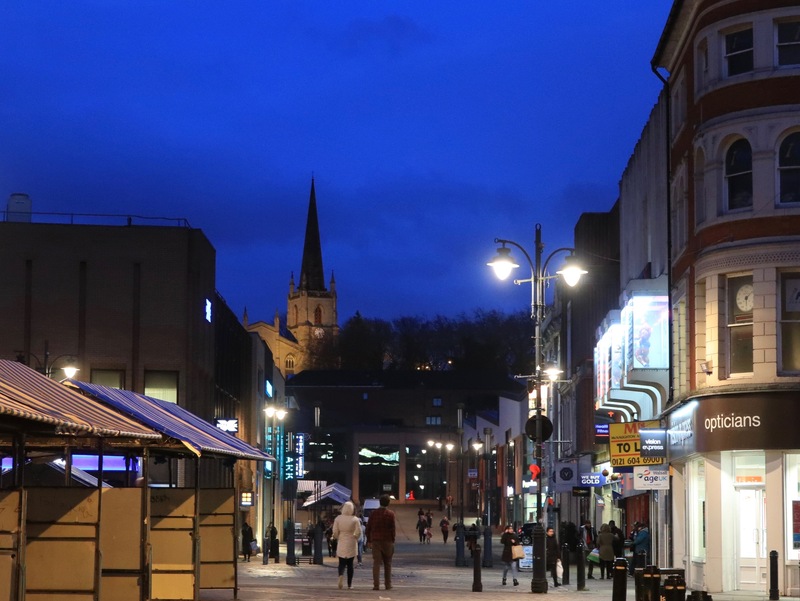 Walsall is haunted by it’s own past, let alone the half-imagined one it has projected upon it. 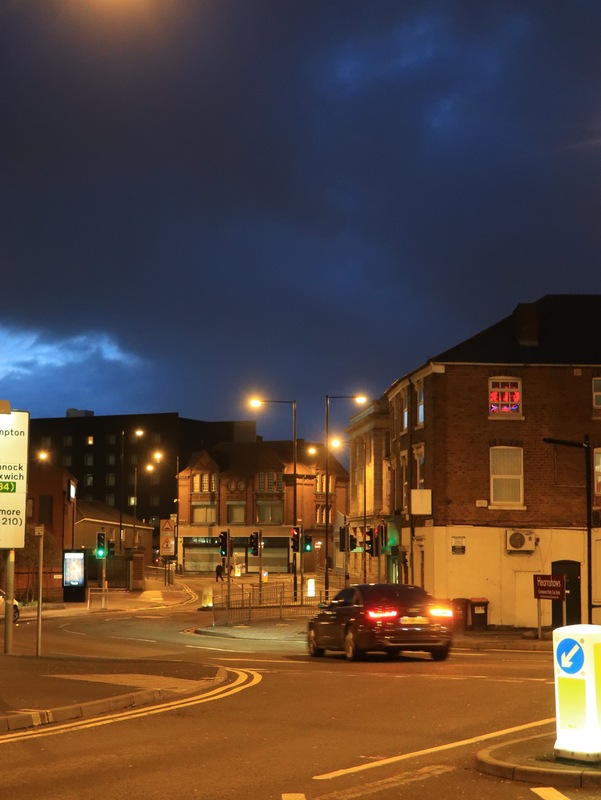 September 14th – Passing through Walsall in the late evening, in a rain-soaked golden hour. Just after a heavy downpour, the light was lush, soft and suffused with gold. The merest hint of a rainbow over St Matthews reminded me why I love this town so much. 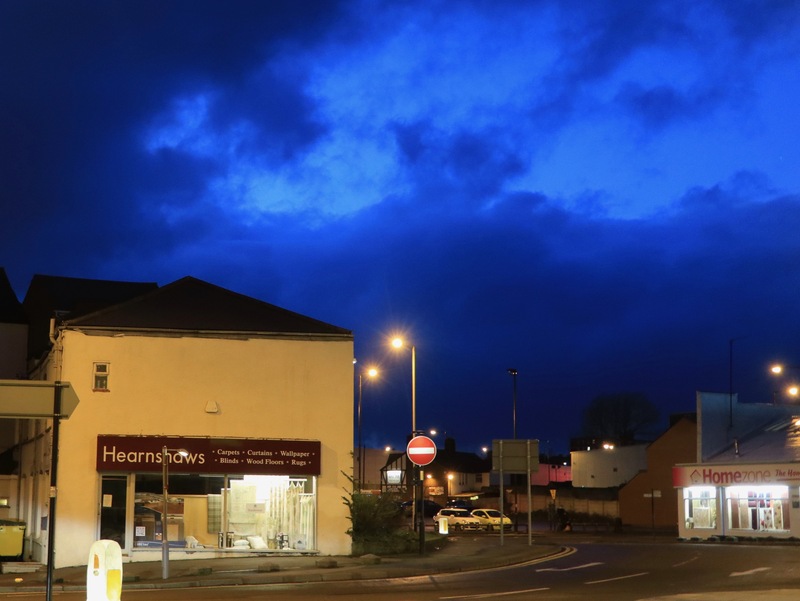 February 9th – I was in town past six, in the early darkness, and the light had that blue, luminescent quality to it you don’t often get. 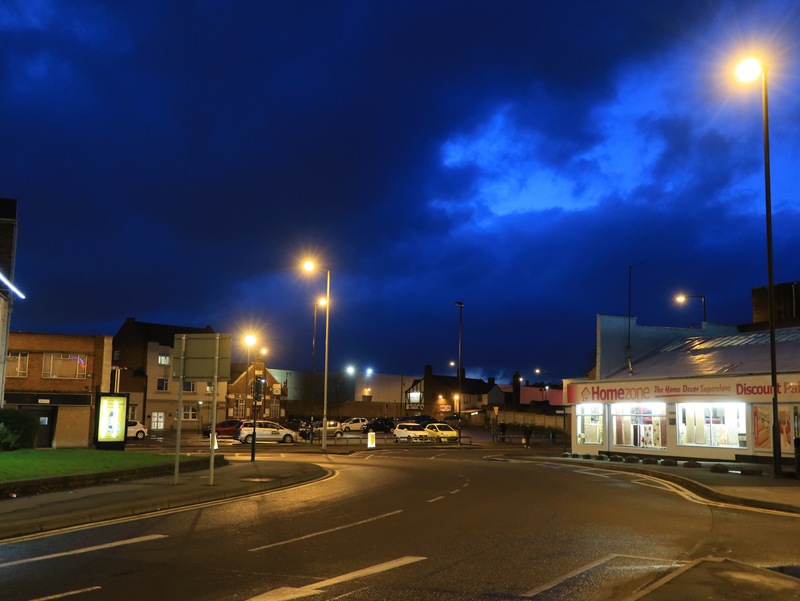 Wandering in town from supermarket to supermarket, the urbanity glowed beautifully. The Canon really loves an urban electric evening, I have to say, and I still do love Walsall. 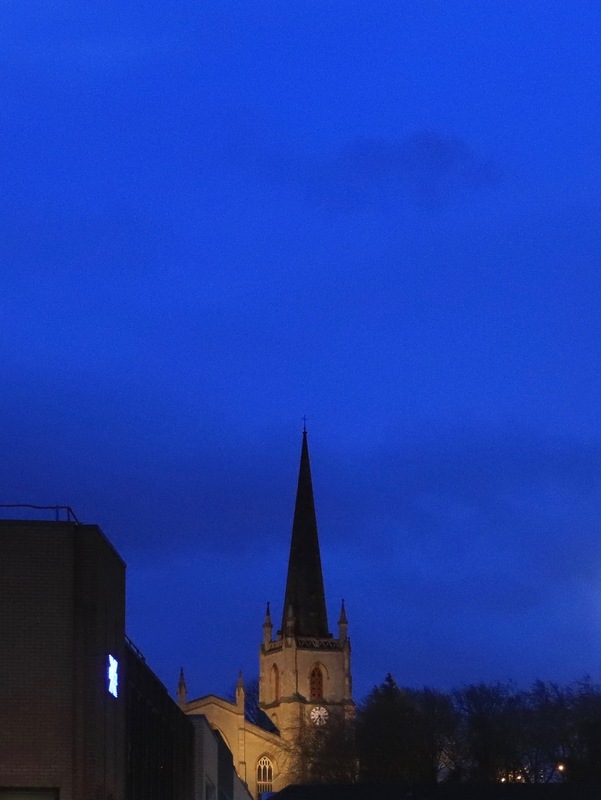 February 8th – Passing through Walsall and running some errands, I crossed Church Hill in a golden hour. Always a bit conflicted about the view from here these days – it’s obscured by tree growth now which is a bit of a shame, but the trees are lovely in summer. May 12th – The rest of the day was marked with damp natural beauty and curiosity; the wild-growing roses were out in St. Matthews churchyard in Walsall, and they fit this decaying corner of God’s Acre beautifully, while not far away, also decaying, the oddity that is Highgate Windmill was standing sentry over the quiet, respectful urbanity as it has done for centuries. I noted all along the journey that marble oak galls are surprisingly prolific this season, and last year must have been very good for the parent wasps who create them. They hang like red fruits in the oak trees. Sad to see the Swan and Mitre in Aston still empty: A remarkable terracotta late Victorian pub, hideously beautiful in mock gothic in that way only Victorian boozers can be, this spectacular building holds many memories for me. Many a time I leant on that railing one a summer evening with a pint in my hand watching the comings and goings to late-shift local factories. Reflecting, I have little physically to show for the few short years I spent haunting this place, but I do have a lifelong friendship and some truly wonderful memories. The past is best thought of in terms of what was found, not that which was lost. February 26th – Really not well at all, I did a few hours of necessary stuff at work and crawled home mid-afternoon. I wanted a change, so I came over Church Hill, and stopped to take some photos while up there. No sign of the peregrines on the bellcote, but this is the first time I realised you can see the Workhouse Guardian’s offices from up here – and they look better from such a distance, and also, terribly out of place. Marooned. St. Matthews itself is suffering the rogues of the weather, and desperately needs some love. I hope the CofE can get around to giving this venerable old church a bit of love soon. July 4th – Independence day, but sadly not from work. To my annoyance, called in on a fool’s errand at 12 noon, my plans for R&R were scuppered. However, taking the slow way back to Walsall, my weariness was cleared by the bright sun, azure sky and pleasant atmosphere. Walsall has many faults and far too many detractors, but it’s not a bad old place. 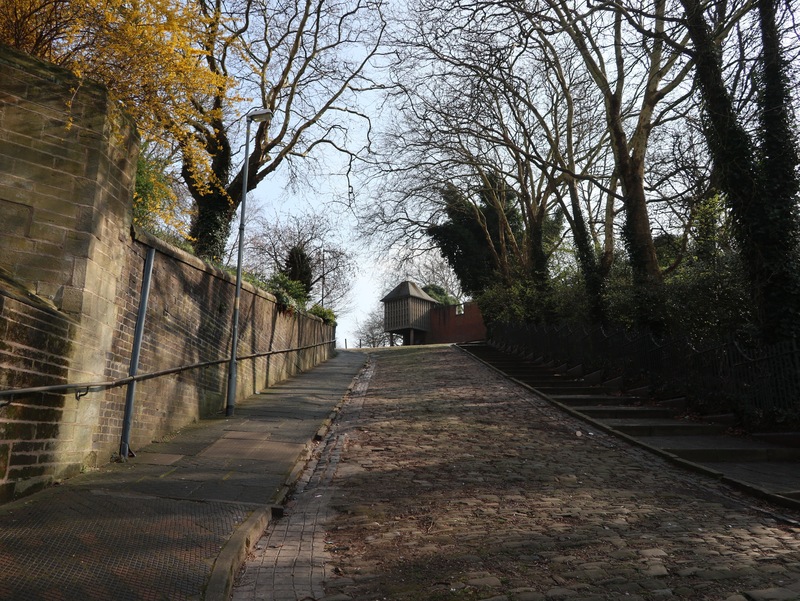 November 29th – Feeling better, we headed up Church Hill for a spot of atmospheric stuff. Taking photos in a solitary fashion everyday makes the process mundane; I’d forgotten the joy and mischief of working with someone else. And up on Church Hill at night, you really need someone else for security. It’s bloody dark. Yes, there is a Late Night Feelings thing going on – well spotted. That’s for Pedro Cutler. Go on, I dare you, tell me this place isn’t beautiful;. Just try it. Eager to see the results, we got on our bikes, and rode home. November 10th – I had to leave work mid morning and head up to Great Wyrley, which was a longer ride than I expected – but very enjoyable, all the same. On the way, I went up Green Lane, but on the way back, came through Leamore. I’d forgotten just how great the view was from the top of Pratts Mill Bridge; on a clear day a great view of St. Matthews, but even on this hazy, smoke-fogged day the view across the terrace rooftops was ace. It makes me think of Douglas Dunn’s ‘On Terry Street’. Walsall – always a surprise in store.